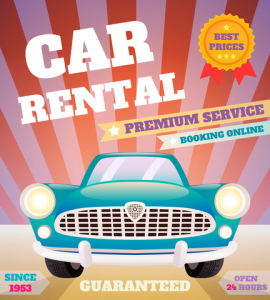 Renting a car? 4 Things to Know Before You Go! Most people don’t start thinking about rental car insurance until they get to the counter, which can result in costly mistakes, according to the Insurance Information Institute (I.I.I.). Many car rental companies now impose various fees after an accident that you may not be aware of and will be held responsible for. These fees can include: towing, storage, impound fees, loss of use, diminished value and administrative services. Before renting a car, the I.I.I. suggests that you make two phone calls: one to your insurance agent and another to the credit card company you will be using to pay for the rental car. Loss Damage Waiver (LDW), also referred to as collision damage waivers and is not technically an insurance product—it relieves or “waives” renters of financial responsibility if a rental car is damaged or stolen. In most cases, waivers also provide coverage for “loss of use,” in the event the rental car company charges the renter for the time a damaged car cannot be used because it is being repaired. It may also cover towing and administrative fees. Loss damage waivers cost between $9 and $19 a day. Liability Protection provides financial protection from lawsuits in the event you are sued following an accident involving a rental car. While by law, rental companies must provide the state required amount of liability insurance, generally, these amounts are low and do not provide much protection. Furthermore, the company has the right to recoup any monies it pays out from the renter. You should probably only forgo the additional liability protection if you have adequate amounts of liability protection on your own car. If you decide you want the supplemental insurance, it will cost between $7 and $14 a day. Personal Accident Insurance will cover you and your passengers for medical and ambulance bills incurred by injuries in a car crash. If you have adequate health insurance or are covered by personal injury protection under your own car insurance, you may not need this additional insurance. It usually costs about $1 to $5 a day. Personal Effects Coverage provides insurance protection for the theft of items in your car. If you have a homeowners or renters insurance policy that includes off-premises theft coverage, you are generally covered for theft of your belongings away from home, minus the deductible. Most homeowners insurance products sold today exclude off-premises theft coverage. Personal effects coverage generally costs between $1 and $4 a day. Call your Hometown Insurance agent today to review your auto policy, we take calls from existing customers or new ones! Our number is: 1-800-568-SAVE (7283) or email us at service@hometowninsurance.com .